Math Methodology is a three part series on instruction, assessment, and curriculum. Sections contains relevant essays and resources. 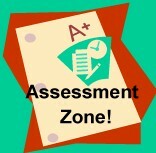 This page continues part 2 on Assessment, providing Assessment Resources. Assessment Essay (Page 1 of 2) The essay addresses systems for assessment (diagnostic, formative, summative, performance), and more on self-assessment, teacher-made tests, and vendor-made tests. Tips for a policy on "redos" of assessments are included. The Partnership for Assessment of Readiness for College and Careers (PARCC) is a consortium of states working to develop the K-12 assessments in English and math related to the Common Core State Standards. See PARCC's practice tests and released test items. The math practice tests from PARCC. Pearson are available in computer based and print formats for each grade 3-8, algebra 1, algebra 2, geometry, and integrated pathway. Test Preparation also includes tutorials that demonstrate how students will navigate the test. The SMARTER Balanced Assessment Consortium (SBAC) member states are developing assessments aligned to the CCSS. See the SBAC sample items and performance tasks. Raising the Bar: Becoming Assessment Ready (2014, February) is a white paper sponsored by Education Networks of American in collaboration with the Consortium for School Networking (CoSN) and the eLearn Institute. You'll learn about key considerations, including why online testing, the assessment consortia, PARCC and SBAC implementation, network infrastructure and support considerations, device considerations, IT support considerations, instructional design and preparation considerations. There are readiness recommendations and a checklist, school district case study briefs, and a list of resources. Do you have the necessary technology? SETDA has been a leader in providing guidance for technology requirements. Even with a sufficient technology infrastructure, educators need additional assistance implementing digital learning. SETDA implemented a project called The Guide to Implementing Digital Learning (GIDL), which "is a free web-based resource to support school and district leaders as they work to ensure that investments in digital learning spark positive results. GIDL includes six topic areas: planning, professional learning, content and software, broadband, devices and tech support. Each topic’s section includes background information, key considerations for implementation, resources and exemplars of digital learning in action." (About This Project section). "Digital testing requires digital learning. Students using technology to take high--stakes tests must have significant opportunities to develop and demonstrate master of tested knowledge, skills and abilities via substantially similar technology prior to being tested. Teachers must be prepared to support this shift in instruction" (p. 1). SETDA also addressed The Broadband Imperative. Among its recommendations is that schools target an external internet connection of "At least 100 Mbps per 1,000 students/staff" by the 2014-15 school year and "At least 1 Gbps per 1,000 students/staff" by 2017-18 (Fox, Waters, Fletcher, & Levine, 2012, p. 2). Schools can test their broadband performance using the School Speed Test, a resource initiative from the Education SuperHighway. SBAC released its guide to technology readiness "intended to help school leaders better understand, plan for, and manage the technology necessary for successful administration of Smarter Balanced assessments" (SBAC Guide description). Technology Guidelines for PARCC Assessments provides "information on hardware and software requirements for administering the PARCC tests" (PARCC description). Pearson has also developed Considerations for Next-Generation Assessments: A Roadmap to 2014, which focuses on five steps to make a successful transition to online assessments, benefits to online testing, case studies, and other considerations. It is available in webinar format and in print. Those steps include to conduct a needs analysis, develop a realistic transition strategy and plan, ensure interoperability, communicate proactively, and anticipate ongoing change. Is your school's Internet access fast enough for digital learning? Find out at SchoolSpeedTest.org, an initiative of the EducationSuperHighway. By following four steps noted at the website, "In less than a minute you'll know the speed of your school's Internet access and the types of digital learning it can support." Is your school and district prepared to handle technology failures and legal liabilities? "Preparations might include reviewing contract language with wireless and bandwidth providers, having a device charging plan or policy to ensure access to an adequate charge for the exam, reviewing the district filtering policy for activities during test administration, strategizing for the administrative response in the event of a technical failure, and consulting with the district legal counsel in an effort to prepare all for potential eventualities" (p. 19). Do your students have the technology skills needed for online testing? PARCC Technology Skills for Computer Based Assessment: Skills begin with grade 3 unless otherwise noted. The list includes general navigation skills, use of universal access features, general answering skills, use of math tools. In math, for example, students should know how to manipulate bars on bar graphs; work with coordinate graphs and interactive number lines. They should know how to manipulate shapes and use fraction models, online rulers and protractors, equation editors, and grade-level appropriate online calculators (e.g., non-scientific, scientific, graphing). Each skill includes examples and notes. Students can gain many of these skills using INFOhio's Tech Skills for Online Testing (or see the full list in Google Docs with individual URLs to specific skill resources). The University of Kentucky in collaboration with CAST created a Technology Skills Checklist for Online Testing. As it contains checkboxes, it can be used to monitor each student's progress in demonstrating skills needed for the particular online test he/she will be taking. Categories include Basic Computer, Keyboarding, Word Processing, Text-Reader/Screen-Reader, and Interaction with Online Assessment. PARCC Tutorials: Per PARCC, "The items appearing in these tutorials are samples used to allow students and educators to gain familiarity with the technology platform and paper-based format that will be used for PARCC assessments." Student tutorials are available for grades 3-5, 6-8, and high school. SBAC Student Tech Skills Grades 3-4, and Student Tech Skills Grades 5-6 are noted by Elk Grove (CA) Schools. Each list provides links to specific online resources to help learners gain skills for using a mouse, keyboarding, highlighting, navigation, and drag/drop. AssessmentLiteracy.org "provides resources to foster a comprehensive understanding of assessment and its role in learning. It is designed to help educators understand the different uses of assessment and how to apply assessment data to support classroom learning." The site "is part of a major assessment literacy initiative sponsored by Northwest Evaluation Association" (About section). Assessment in Math and Science: What's the Point? is a video workshop for K-12 teachers with eight 90-minute video programs, workshop guide, and Web site. Examine current assessment issues and strategies in real K-12 math and science classrooms through videos interspersed with lively discussions of practicing teachers and content experts. Graduate credit is available. There is no fee to view the videos, which are brought to you by Learner.org. Authentic Assessment Toolbox, by Jon Mueller of North Central College in Illinois, is a how-to hypertext on creating authentic tasks, rubrics, portfolios and standards for measuring and improving student learning. The Toolbox also contains a glossary of terms associated with authentic assessment and examples. Balanced Assessment in Mathematics was originally developed at the Harvard University Graduate School of Education. The library, now available at the Concord Consortium, contains over 300 assessment tasks for grades K-12, which you can use in your classroom for free. Tasks are categorized as primary (K-2), elementary (3-5), transition (5-7), middle school (6-8), high school basic, high school, high school advanced, and technology based (7-12). You will also find reports on how to assess mathematical understanding and skills effectively, scoring assessment tasks, and a spreadsheet to assist you with the scoring system for the tasks. Digital Learning Strategies: How do I assign and assess 21st century work? (2013) by Mike Fisher. You will also find multiple resources to accompany this book posted on LiveBinders. Categories include: Think Immersive, Use What You've Got, New and Notable, Web 2.0 Tools, Collaborative Tools, Global Connections, Tutorials, Examples, Quality Digital Media, Digital Portfolios, Rubrics, and Documents/Resources. Fair Isn't Always Equal, 2nd edition: Assessment & Grading in the Differentiated Classroom (2018) by Rick Wormeli will help middle and high school educators to make decisions on differentiation and assessment on several topics. Section 1 provides a rationale for differentiated instruction and delves into acceptable evidence of mastery. Section 2 addresses assessment in a differentiated classroom, types of assessments, including self-assessments, tiering assessments, rubrics, and creating good questions. Section 3 on grading helps educators to decide if they should incorporate effort, attendance, and behavior into academic grades; what approach they should take to grade homework or allow learners to re-do assessments, and setting up grade books and report cards for the differentiated classrooms. The last chapter 20 answers the question, "How do differentiating teachers assess and grade differently?" Grading Smarter, Not Harder: Assessment Strategies That Motivate Kids and Help Them Learn by Myron Dueck (2014) addresses grading, homework, unit plans, retesting, and creativity. It is filled with reproducible forms, templates, and examples of grading solutions to allow students to demonstrate their learning. Ensure that grades measure what students know without punishing them for factors outside their control. Hess' Cognitive Rigor Matrix & Curricular Examples: Applying Webb’s Depth-of-Knowledge Levels to Bloom’s Cognitive Process Dimensions – Math/Science will help educators who are developing curriculum and associated assessments to determine the level of rigor being applied. Norman Webb's Depth of Knowledge levels include recall and recognition, skills and concepts, strategic thinking and reasoning, and extended thinking. Hess relates those four levels to Bloom's Revised Taxonomy (remember, understand, apply, analyze, evaluate, and create) and provides specific math and science examples to illustrate. Dr. Karin Hess' works also appear within publications of the National Center for the Improvement of Educational Assessment, Inc. Multiple Choice Construction Checklist by Dr. Robert Runté (2001) contains tips for better multiple choice questions, true/false questions, matching and completion tests. Reporting test results and item analysis are also included in this set of checklists. Test Accessibility and Modification Inventory (2010) is an evaluation tool designed to facilitate a comprehensive analysis of tests and test items, including analysis of computer-based tests. It was written by Peter Beddow, Ryan Kettler, and Stephen Elliott of Vanderbilt University. Analysis considers the passage/item stimulus, the item stem, visuals, answer choices, page/item layout, fairness, depth of knowledge level. Computer-based test analysis also considers the test delivery system, test layout, test-taker training, and audio. What's the value of performance assessments and tasks? Per Wiggins (2013/2014): "You haven't mastered a subject if you only possess skills and facts in isolation and can only produce them on demand in response to prompts" (p. 13). Hence, performance assessments and tasks provide an ultimate means for a learner to demonstrate mastery. HOT for CCSS: The Dana Center, University of Texas, Secondary Sample Tasks consist of 30 tasks, aligned to the CCSS math standards. How to Design Questions and Tasks to Assess Student Thinking by Susan Brookhart (2014) provides guidance on how to assess higher-order thinking and manage assessment of it, how to view assessment questions and tasks as problems to solve, writing multiple choice question to assess higher-order thinking, and using open-ended and close-ended questions. She delves into performance assessment tasks: the basics, varying the amount of structure, controlling cognitive level and difficulty, and provides an idea bank of performance assessment tasks. Multiple examples from K-12 content areas are included. HOT for CCSS: Illustrative Mathematics is a work in progress to produce illustrative tasks that students would be expected to do related to each of the Common Core State Standards for Mathematics. Sections address illustrations for the K-8 and High School standards. The project is an initiative of the Institute for Mathematics & Education and the Bill & Melinda Gates Foundation. HOT for CCSS: Mathematics Common Core Toolbox has sample task items for elementary, middle, and high school from the PARCC Prototyping Project, posted by The Charles A. Dana Center at the University of Texas at Austin. HOT for CCSS: NCTM contains a Classroom Resources section with lesson plans, interactives and mobile apps, and problems in a searchable database. Items are also searchable by Common Core standards. Performance Assessment--an overview by Samuel Meisels, Ed.D, posted at Scholastic. WeTeachNYC, developed by the New York City Department of Education. You can search resources by grade level, subject area, educational use, audience, resource type, media type, program type, and standard (e.g., Common Core). EdTechTeacher--Rubrics for Assessment includes numerous resources for rubric use and development. These are organized into categories for assessing learning: general, student blogging, wikis, website/digital portfolios, technology and social media; video, screencasting, and digital storytelling projects; podcasts; graphic organizers; and coding and gaming. How to Create and Use Rubrics for Formative Assessment and Grading by Susan Brookhart (2013) includes two sections. In Section 1, Brookhart lays out the basics of rubrics, explains their importance, discusses common misconceptions, and how to write or select effective rubrics. She identifies various kinds of rubrics and their essential components. In Section 2, she explains how to use rubrics for formative assessment and grading. LCI (Learner-Centered Initiatives) Quality Rubrics Wiki delves into "what makes a rubric a "quality rubric" with definitions, examples, and non-examples" and examines "some of the issues that come along with them" (Introduction section, para. 2). Key questions also address types of rubrics, what tasks deserve a rubric, and how to go about developing a rubric. Rubrics for Assessment is a collection of rubrics posted at the University of Wisconsin for assessing virtual learning in simulations/games, portfolios, cooperative learning, the research process, PowerPoint projects, podcasts, oral presentations, web pages, blogs, wikis, math/art/science/writing, and other Web 2.0 projects. There are also rubrics for primary grades and resources for creating your own rubrics. Rubrics for Web Lessons from Nancy Pickett and Bernie Dodge. The School of Education at the University of Wisconsin-Stout has an extensive collection of authentic assessment resources, including for rubrics. Educate and encourage students to practice proper digital citizenship at all times (para. 1). Trust your judgment when using computerized grading programs. According to Guskey and Jung (2016), computerized grading systems are appealing to educators because "they simplify record keeping and seem to objectify grading" (p. 51). In spite of such advantages, however, "teachers judgment has been shown to be more reliable" (p. 50). Teachers need to consider if algorithms in such programs really are accurate and reliable to describe what students have achieved, particularly for determining a student's mastery of a particular objective. The choice of which algorithm to use in computing summary grades is subjective. "Computerized grading programs typically offer the choice of several statistical algorithms for determining a student's summary grade. The most common algorithms include the mean (the average score); median (the middle score); mode (the most frequently appearing score); and the trend score (a score pattern analysis)" (Guskey & Jung, 2016, p. 51). Engrade is a totally free online gradebook suite, which includes the gradebook, an online calendar for homework and events, attendance book, student reports, and online messaging for parents and students. Jumprope is a web-based platform, free for teachers. It includes standards-based gradebook in which teachers can write their own standards, use state standards, or align curriculum to the Common Core. Teachers can record attendance, track student behavior and character development. There are curriculum design tools based upon the principles of backwards planning. Jumprope also provides administrative tools for school-wide reporting. LearnBoost is a free online gradebook and classroom management system, which also has support for use with the Apple iPad. Some features include "managing and creating lesson plans, tracking attendance, maintaining schedules, integrating calendars including Google calendars, [and] seamless tagging of Common Core State Standards" (About section). Capterra.com includes over 40 top gradebook software programs. ClassMarker is online quiz making and grading software with several formats for developing questions. Choose from two testing options: class-based or external testing. The standard account for class-based testing includes full functionality for creating and administering online quizzes and is free. External testing allows you to "embed tests within your website or link directly to them (optionally password protect your tests)" and there is also a free version. Nominal fees are connected to the professional version for each option. EasyTestMaker.com is an online test generator for multiple choice, fill-in-the-blank, matching, short answer and true and false questions. Insert instructions, create multiple sections and alternative versions, and generate the answer keys. Free, Plus, and Premium plans are available. Evo Academics is a cloud-based assessment system from Apperson, which includes a free teacher edition. Create online quizzes, tests, and rubrics; share those with colleagues, manage results, generate student proficiency reports. An online student testing portal supports passages, images, videos, multiple choice and true-false questions, short answers, essays, time limits, and more. FlipQuiz has free and paid versions that allow you to create your own gameshow-style boards for test review. Boards are saved online and look like the TV gameshow Jeopardy. You can have up to five flipcards within each of six categories. You could also use such games for formative assessments and vocabulary review and display them on-screen in your class for group reviews. ProProfs.com has a free online quiz service--Quiz-School. Create and customize your quiz. You can share it with others. You can post the quiz on any webpage, including at your classroom website, or link to it from any webpage. You can create printable versions, too, add discussion on the quiz, set criteria for passing, and provide feedback on what the correct answer should have been. Assign keywords to your quiz for easy retrieval. The site also has a section for creating flashcards for free. Quia for the Web from IXL Learning is a low-cost annual subscription service with a range of options for creating 16 types of games and learning activities, quizzes with any of 10 types of questions, and sharing your activities with others. There are over 1900 shared activities for math alone. You can create classes and track quiz results, create class pages for communicating with students, and maintain an online schedule and calendar. You can upload images and audio clips, and copy/modify any of Quia's activities to suit your own needs. IXL Learning also has a site called IXL Math, with practice problem sets in math for grades preK-8, algebra 1, algebra 2, geometry, and precalculus. Quizizz is free and allows you to create and play multiplayer games for in class or home use. It works on all devices with a browser, including computers, tablets, and smartphones. There's a searchable database of quizzes made by others, as well. Quizlet allows you to make digital flashcards for free. You can import existing questions and answers on your computer or from a web site or type them in directly. There are several modes for students to interact with content. You can view quizlets created by others; there are multiple quizlets available in K-12 math. Quizlet also includes interactive diagrams, or you can create your own, which you can annotate to customize study material. Edulastic is free for teachers. "K-12 teachers can craft homework assessments aligned with the Common Core, track mastery, and collaboratively share their proven curricula with other teachers. They can also create constructive, non-evaluative, practice spaces for students" (About section). A valued feature is the option to create Common Core aligned assessments for specific standards using questions in Edulastic's open resources. You can also create your own from over 40 different technology enhanced Common Core-aligned question types. Formative is a free online tool for teachers and students that works with any internet connected device. Per the website, it is "optimized for any 1:1, BYOD, flipped or blended classroom." Create and upload online assessments, classwork, and homework; assign those to students; get live results and provide feedback. Students can type, draw to show their work, and submit images, so this tool goes beyond formative assessments in multiple choice format. Kahoot "is a learning game created on the Kahoot! platform, which consists of multiple choice questions - as a quiz, discussion or survey - in any topic, language or ability. It’s projected at the front of the classroom, & played by the whole class together in real-time (answering on their own personal device)" (Getting Started with Kahoot user guide). Access is free. Under the Explore Games section you'll find Math by Kahoots (e.g., on fractions, geometry, and algebra topics, and so on), which are aligned to Common Core or state specific math standards, identified in each. MasteryConnect has a free section for common assessment creating and sharing. "Share assessments of any curriculum type such as multiple choice, open-answer, rubrics, writing and oral assessments." You can also modify and remix assessments to suit your own class, and re-upload those to share with the community. MasteryTracker is also a free feature for monitoring and reporting mastery. Within it you'll also find standards resources and content tied to both state and Common Core standards. MasteryConnect has also developed a free 20-page guide called "The Definitive K-12 Guide to Formative Assessment," which provides an overview of this topic, benefits for students and teachers, the difference between formative and summative assessments, the three must-haves of formative assessment, and formative assessment ideas to use in your classroom. HOT for CCSS: Math Reasoning Inventory (MRI) is "is an online formative assessment tool designed to make teachers’ classroom instruction more effective. The MRI questions focus on number and operations and are based on content from the Common Core State Standards for Mathematics prior to sixth grade." There are three assessments in the MRI: whole numbers, decimals, and fractions. Each has two levels, an interview section done face-to-face with about 10-12 questions for assessing understanding and core reasoning strategies and then a written section completed by each learner individually. (About the Assessment section). MRI can be completed in a short time: about 10 minutes for the interview and 5-10 minutes for the written section, and would be appropriate for learners in upper elementary grades through middle school, about grades 4-8. MRI is free for teachers. Sample videos are at the web site that demonstrate how learners think and reason appropriately and also with lack of understanding. The MRI author team is led by Marilyn Burns, founder of Math Solutions. The project receives financial support from the Bill & Melinda Gates Foundation. rCampus.com has Rubric Studio, a free comprehensive rubric design and assessment tool to build simple or complex rubrics with multiple sections and a flexible number of rows and columns. There is also a Rubric Gallery with a collection of rubrics made my members, organized by subject and type of rubric. Socrative "is a student response system that empowers teachers to engage their classrooms through a series of educational exercises and games via smartphones, laptops, and tablets." Socrative is by MasteryConnect and is free. Free apps called Socrative Teacher and Socrative Student are available. yourhomework.com allows registered teachers to post assignments online for their K-12 students. No more excuses for "I didn't know what the assignment was." The basic service is free. Do you need help with online testing? Online testing is a reality. New assessments are being developed by two consortia in connection with implementing Common Core State Standards in mathematics and English language arts. The Partnership for the Assessment of Readiness for College and Careers and the SMARTER Balanced Assessment Consortium are developing those for the general student population. The new online assessments were implemented during the 2014–15 school year. Resources from the State Educational Technology Directors Association will assist states and districts in making the shift to online student assessments. All of the following include math. Some feature other content areas beyond which is described below. American Education Corporation provides research-based core curriculum instructional software for K-12 and up. Among those are RTI and math. Carnegie Learning, Inc. publishes research-based math solutions for middle school, high school, and post-secondary students. Compass Learning for K-12, including RTI and math. Odyssey is the flagship product. Curriculum Associates has K-12 solutions for math, RTI, test prep, and more. Two programs are of particular interest to all states that adopt the Common Core State Standards. Per the web site, i-Ready Standards Mastery will help districts and schools monitor mastery of specific Common Core standards in ELA and Math for grades 2-8. Ready Common Core Mathematics for K-8 balances conceptual understanding with procedural fluency. Edmentum (formerly known as Plato Learning) interventions for K-adult learners. Houghton Mifflin Harcourt -- see the section, At School, for curriculum and assessment solutions. Kaplan Test Prep includes multiple levels and fields. You'll find ACT, SAT, AP exam test prep, GED, and much more. Mastery Education (formerly Peoples Education) includes diagnostic and practice tests geared to state and national standards and Common Core State Standards. There are online assessments in Measuring Up Live, for example. McGraw-Hill Education publishes for pre-K through adult learning. Acuity is a featured assessment product. Measured Progress features the Common Core Assessment Program for grades 3–8 and high school among its assessment products. It includes Benchmarks, Testlets, an Item Bank, and professional development. MetaMetrics "is focused on improving teaching and learning in grades K–12 by enabling educators, librarians and parents to use students’ scores from classroom and state tests to link assessment with instruction." Its free resource called The Quantile Framework for Mathematics "measures mathematics achievement and the difficulty of mathematical skills and concepts ... By placing the curriculum, teaching materials and students on the same developmental scale, Quantile measures help educators to describe which mathematical skills a student has learned, those that require additional instruction and new skills the student is ready to learn. Quantile measures better enable educators to target instruction, monitor student growth and forecast performance on high stakes tests. Parents also can use Quantile measures to support students’ mathematical development by connecting them with targeted mathematics activities at home" (Resources section: MetaMetrics Backgrounder). An extensive database of K-12 instructional resources and math textbooks is available to help educators and parents locate a list of specific skills and concepts that a student is ready to learn. Then "after searching for skills the student is ready to learn, teachers and parents can click on the links provided leading to resources such as worksheets, games, websites, mathematics textbook lessons, and more" (Resources section: What can teachers and parents do with the measure?). Northwest Evaluation Association Assessments include their Measures of Academic Progress (MAP). See the Common Core MAP. Pearson Assessments Note: Pearson's Next Generation Assessments initiative includes white papers that will help states design and deliver new online assessments. Pearson is also the developer of aimsweb, which provides universal screening, progress monitoring, and data management for K-12. Per Pearson, it includes "assessments for fundamental reading, math, spelling, and writing skills for grades K-8, as well as norms for K-12." Renaissance Learning -- see STAR Assessments, including for Math, for example. TI21, Inc. (Training & Education in the 21st Century) offers CASE Common Core Assessments for K-12 in math and English language arts. The benchmark assessments provide practice to prepare students for PARCC, Smarter Balanced, and other state tests. Sample items are provided. SCORE21 is a formative assessment builder in which teachers can build their own quizzes, unit tests, and practice lessons using an extensive item bank of questions. Voyager Sopris Learning has math intervention products for grades K-9 and an algebra intervention. VmathLive is web-based for grades K-8. i>Clicker "response devices are compatible with any brand of interactive whiteboard and any software application, making it a perfect audience response system ..."
SMART response 2 is a formative assessment tool. Teachers: "Create a question set to complement your lesson in just a few minutes. Students answer the questions on their desktop computers, laptops, tablets or phones. Teachers get an instant report (in a pie graph or word cloud), as well as the ability to export those results" (Home page description). Note: This version does not support clickers. However, the earlier version, SMART response, does support clickers. See the website FAQ section for more on this topic. Turning Technologies is a source for response technology, commonly referred to as clickers, for the classroom and related software. Each year you will be faced with interpreting test results particularly for mandated state assessments, and explaining those results to students and parents. It is a good idea to have a working knowledge of key terms. The following resources should help in this endeavor. The International Center for Leadership in Education developed a Rigor/Relevance Framework to examine curriculum, instruction, and assessment. It has two dimensions of higher standards and student achievement organized in four quadrants: acquisition, application, assimilation, and adaptation. The first dimension is based on the six levels in Bloom's taxonomy. The second dimension is an Application Model with five levels based on action: knowledge in one discipline, applying in one discipline, applying across disciplines, applying to real-world predictable situations, and applying to real-world unpredictable situations. Teachers might find it very helpful in planning instruction and assessment activities. Guskey, T. R., & Jung, L. A. (2016). Grading: Why you should trust your judgment. Educational Leadership, 73(7), 50-54. Wiggins, G. (2013/2014). How good is good enough? Educational Leadership, 71(4), 10-16.